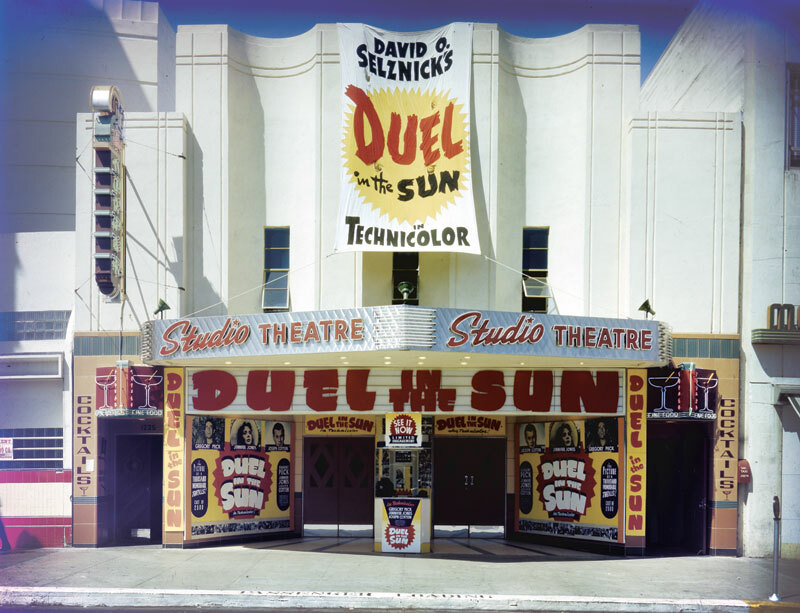 The Studio Theatre 1227 K St., in June 1947. The front of this theatre, like that of the Esquire, has been preserved to the present day ensconced in the Esquire Plaza Building. The neon tubing is still in place and lights up, surrounding “Esquire Grill” now on each side of the machined metal overhang. A private dining room in the grill is situated where the lobby used to be, all that remains of the 495 seat movie house. Like a cat, The Studio Theatre had many lives, beginning on September 27, 1946. One could drop down into the very Art-Deco nightclub “The Topper,”under the lobby, via two stairways on either side of the entrance. The Studio closed in 1957. In 1958 it opened as The Capri Theatre, an art house, with a Peter Sellers film, closing again in 1961. From 1961-1972 it was The Encore Theatre, showing the first run of Lawrence of Arabia (!). In 1972 it became the Plaza Theatre, and became part of the “Pussycat” chain of adult cinemas. Sacramento has had 3 “Pussycats” over the years. Spanish language films followed for a short stint in the late 1970s before closing. Music impresario Carol Gale obtained the theatre in 1983, removed the seats, transforming it into a popular cutting edge music venue, the “Club Can’t Tell” which opened in 1984. Bo Richards AKA”Dr. Velocity” was a manager there. The bar downstairs was then known as “The Metro.” Club Can’t Tell closed in 1988; in 1995, nightclub operator Nick Lygizos tried to recapture the success of the Club Can’t Tell, but was thwarted when popular Sacramento musician Jim Pantages was shot by thugs after a gig, leaving the downstairs bar the early morning of June 9, 1995. In 1996 Lygizos renamed the theatre for the very last time as an entertainment venue, The Pantages Theatre, in honor of the slain musician. It closed in 1997.